With the clarion blast of John Williams’ trademark fanfare, a militaristic waterfall of brassy notes, Star Wars returns to the silver screen in “Episode VII,” otherwise known as The Force Awakens. 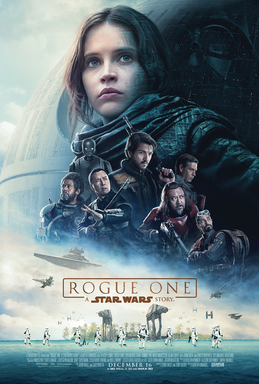 Director J.J. Abrams (Star Trek, Star Trek Into Darkness, Super 8) has been entrusted (wisely) by the slick branding minds at the Mouse House, LucasFilm’s new owners, to inject the franchise with a postmodern jolt of nostalgia-fueled adrenaline, after the late 90s/early 00s prequel series failed to sustain fanboy adoration. Let me add that I find some of the rampant hatred of Phantom Menace, Attack of the Clones, and Revenge of the Sith (oh, those names) a bit disingenuous, lemming-like, and arguably age-ist. We nerds were all lined up in geeky hysteria to devour those films, debate their merits, and consume every last bit of merchandising. Were we thrilled with the films? Not totally. Were they ponderous, meandering, and wooden? Heck, yeah. Did we care? No, because we loved this bizarre universe that was less sci-fi and more Land of Oz with its blend of preposterous names (Count Dooku? ), anthropomorphic machinery, fuzzy Muppet-y sidekicks, and simplistic delineation of right from wrong. Now, we all want to kick George Lucas to the curb, like some previous homeowner who had terrible taste in shag carpeting since we know so much better with our Ikea coffee tables and stainless steel appliances. We seem to be saying, “Go away, you doddering old man. We don’t care if you created all of this from broad cloth. You’re tiresome.” That bugs me. A lot. Maybe it’s because I’ll likely be 50 years old when this latest trilogy wraps up or because I will be forever grateful to Lucas for all the backyard adventures he fueled for this plucky only child, but I think he deserves a break and our gratitude. …That said, I’m sure glad he didn’t direct this latest installment. Abrams is not the most ingenious of directors. If Spielberg and Lucas, his most immediate forebears, were consummate recyclers of B-movie tropes (Indiana Jones, Jaws, and, yes, Star Wars), then Abrams is, at best, a fabulous remixer. He takes the Spielberg/Lucas greatest hits, adds a dash of irony, self-satirizing humor, marketing panache, and copious lens flares in a transfixing gift for cinematic misdirection. Take his two Star Trek films, for instance. Great fun, right? Yet, there is not one original thought between them that wasn’t already expressed a hundred times over in earlier Trek films and series. Into Darkness is pretty much a remake/reinvention of one of the better films Wrath of Khan infused with the earth-bound whimsy of the best Star Trek … The Voyage Home. That’s what Abrams does, and that’s just fine. The instinct for escapist self-preservation is Hollywood’s bread and butter, and, with the assured success of Force Awakens, Abrams is sure to be Tinseltown’s favorite son. Star Wars: The Force Awakens gives us everything we want, with few surprises. While every other Star Wars film has debuted in May to provide air-conditioned cinematic asylum from the hottest days of the year, Force Awakens arrives just in time for Christmas. Not unlike those Disney Park rides that dump you right into a gift shop so you can load up on memory-preserving souvenirs, this film seems built to send you packing to Toys R Us posthaste for some last minute stocking stuffers. Just like the holidays, Force Awakens showers us with familiar, comforting indulgences. X-Wing and Tie Fighters engaged in balletic dog fights, every sound effect you remember well-preserved but with new paint jobs so you’ll have to capture the newest miniature versions for your personal fleet at home. C-3P0 (Anthony Daniels) and R2D2 (Kenny Baker) are still fussy as ever, but with a little third-act intrigue to keep you guessing. Chewbacca (Peter Mayhew) remains adorable as a Golden Retriever on two legs who happens to be really adept at piloting the Millennium Falcon. Han (Harrison Ford) and Leia (Carrie Fisher – who looks like she’s about to crack a joke every time she speaks, thank goodness) are a little grayer and wizened, mercifully winking at the proceedings but also providing much-needed flesh-and-blood poignancy. Any tears I shed were all due to the two of them – both from my joy at seeing them in these iconic roles again and in their ability to inhabit those characters, thirty years later, so effortlessly. The plot (spoiler … well, 38-year-old spoiler) is pretty much a carbon copy of Star Wars: A New Hope, itself ripped off just two movies later for Return of the Jedi. Scary fascists (this time called “The First Order”) in matching outfits can’t tolerate free-thought or weirdly-featured cantina-frequenting creatures, so they build a big ol’ planet-sized armageddon machine; and Dorothy and The Tin Man and The Scarecrow and The Cowardly Lion blow it up real good and save the universe (for now). Actually, that sounds a bit like rhetoric from the Republican presidential debates. Maybe a disenfranchised Lucas is moonlighting for Trump these days? Damn, Force Awakens is fun, though. Seeing beloved characters in a place and time you’ve worshipped since you were a kid is akin to the perfect extended family reunion … that is, if you liked your extended family. Abrams is a canny filmmaker. He uses the free-pass such familiarity brings to introduce a new generation (literally and figuratively) of characters who end up carrying the torch quite nicely. 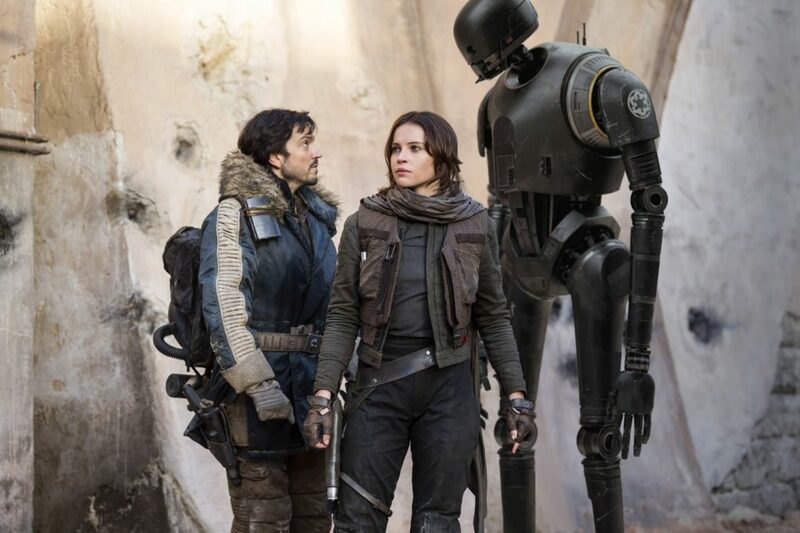 Furthermore, Abrams layers an Empire Strikes Back-style ominous gloom over Force Awakens’ Saturday matinee escapades – a sense of forboding that holds welcome promise for future installments. I will also commend Abrams for bringing us our most diverse Star Wars cast yet, offering a galactic reflection of our earthly life today. About time. It wouldn’t be Star Wars without an action-figure phalanx of oddball spirit guides and gleamingly militant heavies (played by a Love Boat-sized cast of “special guest stars”). Spotting them is like playing a space-faring game of Where’s Waldo? Look, Daniel Craig is a cheeky Stormtrooper! Look, Max Von Sydow is Alec Guiness! Look, Gwendolyn Christie is a cheeky chrome-plated Stormtrooper! Look, Domhnall Gleeson is Peter Cushing! Look, Andy Serkis is Gollum-channeling-The-Wizard-of-Oz! Look, Lupita Nyong’o is … Yoda? Star Wars: The Force Awakens will satisfy all you playground Han Solos and Leia Organas and Luke Skywalkers. Indeed, the 12-year-old boy in me was transported … a long time ago in a galaxy far, far away. In that sense, Abrams and crew did their job flawlessly. But this installment was easy. The audience was waiting and appreciative to see the old band back together, playing the classic tracks we know and love. The trick for the upcoming films (to mix Abrams’ Star franchises blasphemously)? To explore strange new worlds, to seek out new life and new civilizations, to boldly go where no (hu)man has gone before.